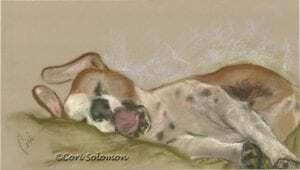 This pastel drawing of a sleeping dog was a fun one. This dog was a real character and the owner sent me pictures of this rather large dog climbing the cat tree. Just envisioning the cats and the dog together made me laugh. The drawing show some of the diversity of my drawings.